Both breakfast and dessert waffles are a favorite food of many people, but finding the best waffle maker to make those thin and crispy waffles isn’t always an easy task. While there are plenty of waffle makers around, few live up to the expectations of those home cooks who want to make their own homemade waffles, but don’t want a lot of hassle or a difficult cleanup process. So, we searched around and have come with some of the best waffle makers for thin and crispy waffles that get the most positive ratings and reviews. 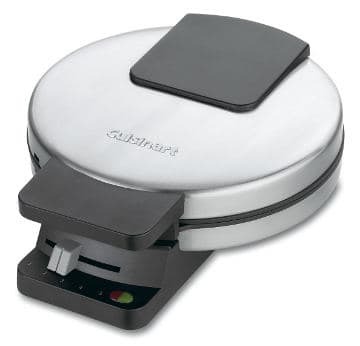 The Cuisinart Round Classic Waffle Maker is designed to make those thin crispy waffles that most people grew up with. This is an attractive fairly good small appliance that will look good on your kitchen counter top and is capable of making excellent waffles. However, users do need to know that there is always a bit of trial and error when using a new appliance, and waffle makers can be trickier than most because they require the recipe to make perfect waffles. Making sure you allow the waffles to cook completely through before opening the lid will result in less sticking issues. 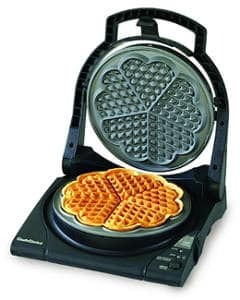 The company also recommends that people who want crispy waffles set this waffle iron at 4 or 5. They also suggest that you use ½ cup batter for each waffle. This product comes with a recipe book. Dual indicator lights tell you when the waffle maker is ready to add batter and when your waffles are done. Round non-stick cook plates with 4 quarters. Maker can stand on end, taking up less place when stored. If you like crispy waffles, then you will love this heart waffle maker by Chef’s Choice. This maker does indeed make thin waffles, which is what this review is all about. We also love the unique shape of this waffle maker appliance as it makes breakfast a bit more festive and fun. The little heart shaped waffles can make a cute statement first thing in the morning or any other time of the day. This machine alerts you with an audible beep when it is ready for batter and has finished baking the waffle. It also stores in an upright position, taking up less space in your cabinet and produces 5 perfect little heart shaped waffles per batch. You can choose between deep-bake mode or crisp exterior/moist interior settings. Floating plate helps ensure uniform thickness. Cord storage keeps cord safely out of the way when storing the waffle maker in you cabinet. Reviews and ratings for the Chef´s Choice Waffle Maker are overall quite positive. 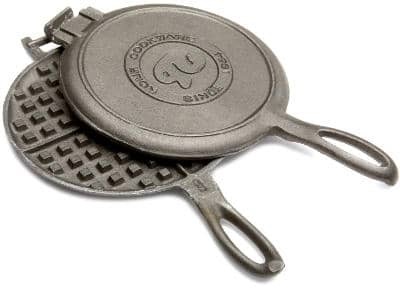 While there are a few users who have mentioned that the waffles from this iron come out a little too thin, the majority of users didn’t have any problems with the thinness of the waffles. The Black & Decker G48TD is a 3-in-1 waffle appliance that, like many appliances designed for multiple functions as opposed to one dedicated function, performs all its functions reasonably well, but probably none of each function exceptionally well. However, if you are looking to save money or space by purchasing an appliance that performs more than one function, this waffle maker/grill/griddle should do a fairly decent job for you. Also, this waffle maker combo stores neatly on its end to save room in your kitchen cabinet and there are clips that hold the plates in place once you have the right plates for the right job in place. The plates on this grill are removable, which makes cleaning easier than with some other grills. Grids make 4 waffles and can be reversed for grilling sandwiches. 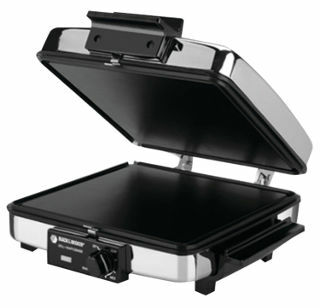 Top of this appliance folds down so you have 2- 8 inch griddles for pancakes or hash browns. Reviews for this Black & Decker 3-in-1 Waffle Maker are above average. While some users state that this appliance gets a bit too hot and that the no stick coating peels off rather quickly, other users find that they have little problem using it. Cleans Easily, the Plates can be removed allowing you to soak them if need be. Makes good grilled sandwiches as well as good waffles. The Rome Old Fashioned Waffle Iron is a waffle maker that you may have seen your grandmother or great grandmother use. It consists of two cast iron plates and is designed to use on a stove top. The cast iron does need to be cured according to directions, prior to using it, to ensure that your waffles turn out like they should. While this is no doubt a well made and dependable waffle maker, users should note that this is the type of waffle maker that makes better waffles the more waffles you make, since over time the cast iron will get better and better seasoned. Because it consists of two plates that you fit together for each batch of waffles, you also should note that learning how to use this maker will take some practice. Reviews for the Rome Old Fashioned Waffle Iron are quite good with most users admitting that there is a bit of learning curve, and warning other users that the handle of this appliance gets quite hot and so you need an oven mitt when using it. Can be used on an electric as well as gas range. In conclusion, if you are looking for the best waffle maker that can make those thin and crispy waffles you love, then you will find one of the above waffle makers very useful.